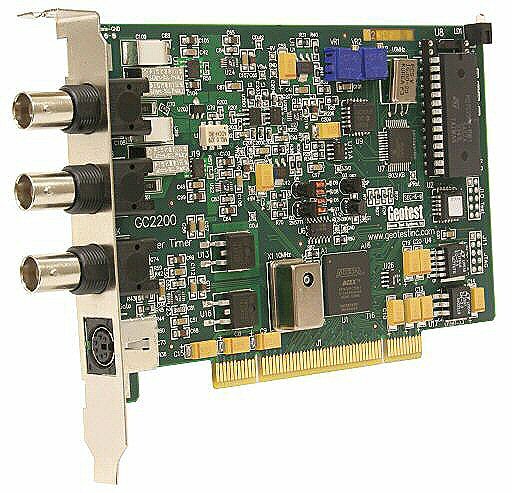 PCI Timer / Counter Card - GC2200 Series | Marvin Test Solutions, Inc. The GC22x0 family of PCI universal time interval counters offer many of the measurement and timing functions of high-end stand-alone frequency counters, including accumulate, auto ratio, frequency, fast frequency (GC2220 and GC2230 only), period, ratio, single period, test clock, time interval, time interval delay, totalize, totalize gated, totalize gated once, and pulse width. There are three models available: the GC2210, GC2220 and GC2230. The GC2210 frequency range operates to 225 MHz, the GC2220 covers frequencies up to 1.3 GHz, and the GC2230 covers frequencies up to 2.0 GHz. The GC22x0 series counters have two signal input channels via BNC connectors, an external timebase input, arm input, and a gate signal output. The separate input signals can be used for arming and gating the circuitry, and controlling the timing of the analysis (start / stop duration) for maximum measurement flexibility. The GC22x0 series counters use an on-board microprocessor with embedded firmware to off-load processing tasks from the main CPU. The counters use high-density, low-power field programmable gate arrays (FPGA) to perform complex logic tasks. Reciprocal counting techniques are used to achieve high resolution measurements on lower frequency signals without sacrificing measurement time. These techniques provide a fixed number of digits of resolution for all frequencies rather than a fixed resolution in Hz for the same gate time. The GC2220 and GC2230 can measure frequencies to 0.1 parts per million (seven digits) in just 1 ms and resolve each time measurement to 100 ps. This ability to precisely resolve frequency and time allows for increased accuracy as well as reduced measurement time. When combined with 2,300 measurements / sec, one of the fastest rates available, more data can be acquired in a single second than a typical GPIB counter can acquire in one minute. Additionally, the counters include an on-board 10 MHz TCXO for internal frequency reference. An external 10 MHz input is also available for use with external timebases. The board is supplied with the GXCNT software, a software package that includes a virtual instrument panel, and a Windows 32/64-bit DLL driver library and documentation. The virtual panel can be used to interactively program and control the instrument from a window that displays the instrument’s current settings and status. In addition, interface files are provided to support access to programming tools and languages such as ATEasy, LabView, LabView/Real-Time, C/C++, Microsoft Visual Basic®, Delphi, and Pascal. An On-Line help file and PDF User's Guide provides documentation that includes instructions for installing, using and programming the board. A separate software package - GtLinux - provides support for Linux 32/64 operating systems. Control Count gate can be controlled by software, or by events on the second input channel (Gated Totalize). In Gated Totalize, start and stop event slopes are selectable. Range DC - 225 MHz on either input.